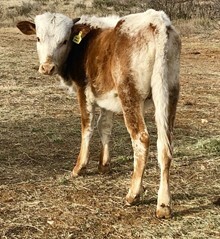 Vocal Tempo is a lovely red cow with huge shapely horns and white spots. Per Rocking O Longhorns from who we gladly purchase Vocal Tempo, she is described as “Out of the eight heifers we have added from the great Stockton/Burton herd, Vocal Tempo is our favorite from a genetics perspective. Her grandsires Tempter and Overhead are two industry legends and foundation bulls for Stockton Ranches. Her grandams are the $80,000 cow Outspoken and Zhi-Spicy Pony, one of the first 90” cows in the breed who would probably sell for more than Outspoken if she were available for sale. There’s a lot to like here!” We agree!! And her first calf, a bull calf born on the 4th of July 2017 is good looking, strong built, very friendly and is named CER Thank You Hotshots (JTW Testosstryone x Vocal Tempo). Hotshot comes with a true story that no one would believe if they saw it in the movies! Vocal Tempo brought us one of the wildest colored red/white spotted, frosted, most decorated heifer calves you can imagine on 8/11/2018 who clearly earned the name CER Fancy Nancy! (CER RJ Admiral Rattler x Vocal Tempo). Like her parents Fancy Nancy is curious and friendly and will eat from your hand! What an exciting genetics she will bring to our breeding program!